Read those articles along with this one. For more-detailed advice on installation of sprockets and setting the gear range, see the section on sprockets in the main article on internal-gear hubs. 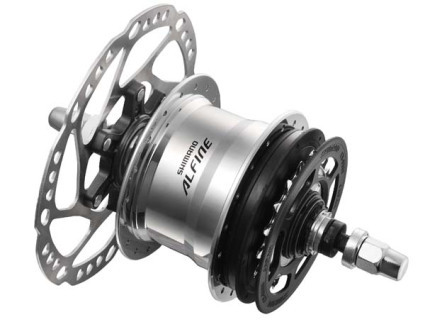 The Alfine 11-speed hub is a high-end model which has a Shimano CenterLock disc-brake fitting. The 11-speed is similar to the Nexus and Alfine eight-speed hubs. The Alfine 11-speed hub uses 3-lug sprockets common to many brands, 16 teeth and up. The sprocket supplied with this hub has a chain guide plate attached, which will help keep a loose chain from coming off and potentially damaging the shifting parts. This sprocket works with derailer chain except for the narrowest (10-speed and up). Wider chain may also be used. Choose the sprocket and chainwheel to set 9th gear of the hub for level-ground riding (typically, around 75 gear inches, 6 meters development). The Alfine 11 hub has been with us a few years now, and there is a fair amount of information out there. However unless I'm mistaken, no-one has yet put in simple terms how the hub generates the 11 gears, or collected much of the available information in one place. This is (for good or ill) my stab at it. Please let us know of any errors or omissions and we'll correct accordingly. In a nutshell, the hub is best thought of as a two-speed (reduction or direct) gear which drives a six-speed (direct or 5 increase options) gear. The six-speed gear is itself a 3x2 gear, i.e. an intermediate three speed (direct or 2 increase options) gear which in turn drives a further two-speed (direct or increase) gear. The gear ratios are selected via four selectable clutches (one sliding clutch, three lockable sun pinions) and four automatically selected, spring-preloaded roller clutches. The eleven available gear ratios all use at least one gear train, and three gear ratios use all three gear trains in series. The gearsets could give twelve ratios (2x6) of which only eleven are used, because one ratio is a near duplicate of another. The unused gear is the direct drive gear. Instead, a gear that gives almost the same ratio is used, despite its using three gear trains and presumably being less efficient. The image below is of a cutaway of the hub as seen from the rear or top of the bicycle, so the sprocket is on the right in this view, and the gearing stages are in the order in which power is transmitted, from right to left. The four roller clutches, RC1 through RC4 from right to left, are more visible in the cutaway view below. The first-stage sun pinion (the helical-cut, two-section stepped one, at the right) is permanently locked to the axle. The remaining three (suns 2 and 3 in the hub's second stage; and sun 4 in the third stage) are selectively locked by pawls that pop out of the axle, as with the Nexus and Alfine 8-speed and the latest Nexus 7-speed hubs. 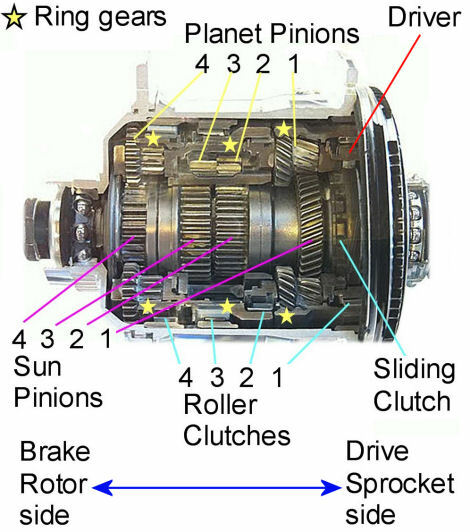 The first stage is similar to that found in an Alfine or Nexus 8-speed hub, in that it uses a sliding clutch to provide direct drive to the planet cage. The clutch is actuated by an axial cam and is locked in gears 7-11.When the the clutch isn't locked, a roller clutch (RC1) takes drive from the driver to ring gear 1 (RG1) instead, driving the planet cage by way of the planet gears, for a speed reduction in gears 1-6. The reduction gear ratio is 0.527, the same in an Alfine or Nexus 8-speed hub, and the tooth counts (with the stepped planet gears, visible in the picture) are the same. Drive next passes from the the planet cage of the first stage to the planet cage of the second stage -- they are locked together. The second stage has stepped planet pinions, a single ring gear and two sun gears (suns 2 and 3), giving the increase ratios 1.462 or 1.667 depending on which one is locked to the axle. When neither sun pinion is locked, roller clutch 2 (RC2) transfers drive directly from the planet cage to the ring gear (RG2), so they turn at the same speed. The ring gear of the second stage is one piece with the planet cage (PC3) of the final two-speed gear stage. When its sun gear is locked, its ring gear drives the hub shell via roller clutch RC4, for an increase ratio of 1.292. When the sun gear is not locked, the second stage drives the hub shell directly via roller clutch RC3. Except that they use reduction in the first stage, gears 2-6 are achieved in the same way as gears 7-11. Once you know what it is that you are looking at, you can see nearly all the relevant parts in the sectional views above. The lines of the table below show the path of power transmission for gears 1 through 11. S1, S2, S3, S4 for sun gears 1 through 4. Where parts in two stages are effectively one piece, both of their names are shown in a single table cell. For example, "PC1 PC2" identifies planet cages 1 and 2, which are locked together and always turn at the same speed. Multiplying the ratios of all of the active stages together produces the final ratio. For example, the overall ratio is 0.878 in 4th gear. Only the first and second stages are active in 4th gear, and 0.527 * 1.667 = 0.878. The table shows only ratios, not gear tooth counts. Bruce calculated them and the anonymous"jb" in the Cycle Touring Club (U.K.) forum confirmed them. John's workbook of hub gear ratios, http:/john-s-allen.com/hubratios.htm gives the tooth counts. Sun pinions are labeled from right to left in the hub (left to right in the table, right to left in the sectional view). If the hub behaves oddly or makes noises in some gears and not others, the table above can help to identify which parts may be responsible. When RC1 and RC2 are not being used to drive, they are overrun, introducing a small parasitic drag. When S2 or S3 are not locked, they turn (usually backwards) on the axle, not introducing an appreciable parasitic drag. When S4 is locked, RC3 is overrun (giving a small parasitic drag). When S4 is not locked (and RC3 takes drive to the hub shell) RC4 is not overrun; instead S4 turns backwards on the axle with low parasitic drag. There are some measurements in a thread on the CTC forum on the but in essence all shifts are a nominal 5.0mm except for 6-7, the sliding-clutch shift, which is longer (around 6.4mm) and 10-11 which is also longer, presumably so that the cable will run full slack in gear 11 even if it is a little draggy. [See our Shimano internal-gear hub cable pull crib sheet for details -- John Allen] Other than Alfine-11-specific shifters (Shimano, JTek, Versa), there are no suitable alternatives. The cable-operated mechanism requires careful adjustment (see comments by Aaron Goss, below). The cable approaches the pulley at the top with all cable-operated Alfine 11-speed hubs. Shimano sells only a dual-paddle shifter for flat bars for the Alfine 11-speed. JTek makes a bar-end shifter, probably the most reliable option for drop bars. Versa used to make brake-lever shifters but these had serious reliability problems. Microshift brake-lever shifters are similar to Versa but have a better reputation. Some owners ask about converting from one kind of shifting to the other. The conventional hub has a return spring in the shift control mechanism that tensions the cable and drives upshifts. The Di2 version does not have the same spring; the shift is motor-driven in both directions. Conversion therefore requires replacing the axle assembly and so, disassembly of the internal mechanism. Replacing the entire internal mechanism is simpler. As with other internal-gear hubs, the cyclist should release force on the pedals when shifting. Some shifts occur only when internal parts of the hub are no longer held in place, transmitting power. If pedaling continues during some shifts, parts may engage partially, risking damage. Unlike most of today's internal-gear hubs, the Alfine 11-speed hub is oil-lubricated, and has an oil port. Shimano offers a recommended oil-change schedule and oil-change kit. Oil lubrication is desirable for an internal-gear hub, if the oil is replenished and changed regularly. However, it is possible to lubricate the Alfine 11 better than Shimano suggests. As "jb" points out in the CTC forum (see link below), the standard oil-change procedure does not thoroughly clean wear particles out of the hub. Partial disassembly of the internal mechanism allows a thorough cleaning and wear inspection. Following this, spot lubrication of internal moving parts is advisable so they are ready to go with the first pedal stroke: oil injected from outside can take a while to reach them. Lubrication of ball bearings with waterproof grease is also desirable. Finally, the hub is reassembled and oil is injected through the port. The large right-side bearing seal of the Alfine 11-speed hub often leaks. Some hubs have been almost completely dry when opened up for inspection. Changes in temperature and atmospheric pressure can pump oil out of the hub. Storing the bicycle under shelter, but where temperature is near that outdoors, can reduce leakage. Adding oil between oil changes will keep a leaky hub lubricated. Leaking oil can be messy, and if it runs down the spokes, it can make a rim brake squeal and grab. Aaron Goss recommends laying the bicycle on its right side with a rag under the hub for storage or transport, to catch leakage. Shimano oil is expensive. Phil Wood oil has been used with success. It is viscous, and reduces leakage. Automatic transmission fluid also has been used. It is quite watery, and so more prone to leakage, but preferable in very cold weather. Nonstandard lubrication will void the warranty on the hub. "You pays your money and you takes your choice," as the saying goes. 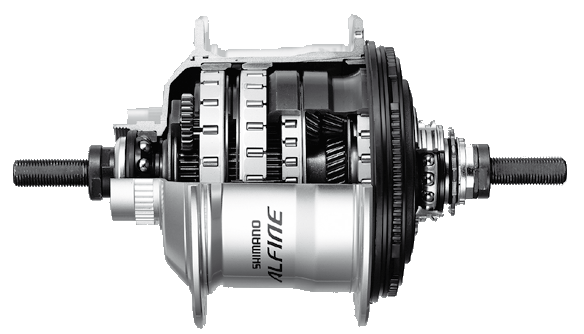 The table below links to Shimano's documentation on the Alfine 11-speed hub and related products: Dealer manuals, user manuals and parts lists/exploded drawings. This documentation is available in pulditple languages -- there is a language selector on the Web pages. Shimano lists the parts of the internal mechanism only as modules. In the Alfine 11 hub, all the planet pinions run on roller bearings (as per Alfine 8, premium Nexus 8 and Rohloff hubs), so as to decrease losses. Once again (as in the Nexus 7), Shimano has avoided having a nice efficient direct drive gear 5 (or 6). As it is, the hub uses a single gear train in gears 1, 7, 8, 9, thus these are likely the most efficient gears. Two gear trains are used in gears 2 ,3, 4, 10, 11 (medium efficiency), and three are used in gears 5 and 6 (probable lowest efficiency). Under very low loads, the parasitic losses from the overrun roller clutches may be more apparent than the gear train (meshing + bearing) losses. If the gear ratios are set in a vaguely sensible fashion (i.e. so that the 'flat road, no wind' gear is about 70-80% of top gear, (see advice here) then gears 7, 8, 9 (which are relatively efficient) are likely to be the most used gears. On a heavily loaded touring bike, gear 1 is likely to be heavily used too. This being the case, the weighted average efficiency of the gear may not be as bad as the numerical average efficiency might suggest. Because the Alfine 11-speed first-stage gear teeth are cut helical instead of straight, there is a question about the efficiency of gears 1-6, as axial thrust loads must be supported by non-rolling-element bearings. Some folk have suggested that there ought to be more gears yet with different clutching (because there are sixteen possible permutations of four clutches) but the two sun gears of the second stage cannot be usefully locked at the same time. Unity ratio in all three stages is the only allowable and unused combination. In addition to the drag from the gears described earlier, there may be drag from the bearing seals. Drag from the large bearing seal on the right side is highest when coasting, or in the lowest and highest gears, which are farther away from unity ratio. There is also light friction from the slipping roller clutches. Roller-clutch drag should probably be least in 8th and 9th gears, which use only one of the three gear trains, so the roller clutches for the other two are engaged.. In theory, it should be nigh-on impossible to lose all drive in this hub. Provided the gears are not jammed and you can still engage the sliding clutch, and RC2/ RC3 are still working, you should be left with a viable direct drive gear even if you can't lock S2, S3, S4 etc. There are some very helpful instructions and photographs (prepared by jb) in the midst of the long running Alfine 11 thread on the CTC forum. jb has also posted diagrams which show the drive path through the hub in the various gears. On subsequent pages there are several other useful photos and posts. We have already mentioned the long thread about reliability on the CTC (Cyclists Touring Club, U.K) member forum. The cable shift control is very sensitive to variations in build tolerance and adjustment. The reason for this is that the cassette joint may only rotate about 135 degrees total, i.e. about 15 degrees per shift, tops. (This limitation occurs because the right-hand hub cone is supported on two prongs, leaving gaps that the selector mechanism pokes though) This makes building the hub accurately very difficult for Shimano and also makes it sensitive to the exact external setting when in use. Unfortunately, with new hubs, the cable usually settles and this throws the external adjustment off; worse still, the build tolerances are such that the 'correct adjustment' (dots lined up in gear 6: http://www.sheldonbrown.com/nexus-mech.html) is not always the 'optimum adjustment'. 'Rofan' (see Alfine 11 reliability thread) has reported that the shift control sleeve inside the hub is lighter built and longer than the equivalent eight-speed versions and this presumably makes it more likely to give trouble through wear or high shift load. The helical stage 1 gears were presumably added at a late stage (the EV tech doc shows straight-cut gears), I suppose to make the hub nice and quiet. However this generates an axial thrust load which can cause problems with retention of sun gear 1 on the axle (as jb has described in the reliability thread). Arguably, whoever designed the gear train screwed up here, in that when you pedal hard, the sun pinion S1 is forced rightwards against the retaining clip, rather than leftwards against a fixed shoulder. Maybe there is a good reason for this, but if the helical gear had been cut the other way (or left it straight cut), this fault may not occur in the same way or perhaps at all. The problem is especially likely if you routinely pedal hard in gears 1-6. The clearances in all Shimano internal-gear hubs are tight; any shrapnel in the hub (particles bigger than ~0.25mm) will probably cause one or more gear trains to jam and/or be damaged. Stage 2 and stage 3 could jam entirely and you would still have some working gears, but if stage 1 starts to jam you are in trouble because the sun S1 is locked to the axle and the stage-1 gears must turn at all times when you are pedalling. As already mentioned, these hubs often leak oil. It isn't clear where the hub is meant to be vented; it seems to me that some leakage (most often on the right-hand side) is more or less inevitable. Because the hub is oil-lubricated, water incursion is less likely than with the 8-speed Nexus and Alfine hubs -- as long as the oil isn't allowed to leak out till little is left. The electrical connection for the motor unit does not withstand repeated disconnection and reconnection, which is necessary to replace a tire or disc rotor, etc. A video linked at the end of this article describes this problem in detail. Overall, the Alfine 11 hub is (internally) only a tiny bit more complicated than a Nexus/Alfine 8-speed hub, and apart from the helical stage 1 gears, there is nothing much new and different inside it. So, with one or two caveats, the internals ought to be reasonably reliable; an intrinsically 'bad hub' ought to become evident within the warranty period. However, the efficiency is rather low in many of the ratios, the helical gears are probably not the best choice for high torque use in low gears, and a significant proportion of users reports skipping or other problems, which can arise for several reasons. If a Gates drive belt is overtightened, it can interfere with shifting, at least on the 8 speed hub. Also see Aaron Goss's comments below about problems when it is not tight enough. The Alfine 11 I did not like at first. But after servicing well over 50 of them, I have a new appreciation for them! It is quite a marvel! The Rohloff is nice but a mystery inside since we are not allowed to disassemble it! They won't sell the special tools or instructions. Luckily it is made 10x better than any other hub on the planet so you really cannot afford not to buy one! Seriously. Every Alfine 11 hub I have serviced so far has been trouble-free. Shift problems were always related to the cable or motor unit. There was an early recall of the cassette joint. There is a date code stamped on the arm. I know the good ones Shimano sent me are stamped JF, KJ, or IK and the only bad ones I have come across are IF. I saw one extra grande fellow shear off his CenterLock brake disc mount, but that was a one-in-a-million case. I have heard of people saying the hub slips in this gear or that but they did not after I serviced them. A recent fellow sent me his hub with this problem but he only sent me the internals so I could not examine the drive rings inside the hub. I have never seen one come loose. They are press fit in with splines, so it would be amazing if one did break free. I think, perhaps, the #1 problem with the Alfine 11 is belt drive. Lots of Alfine 11 bikes come stock with Gates. Not a single belt bike I have ever worked on came in with the belt tension high enough. A "snapping" (ratcheting) belt can feel exactly like a hub skipping on a test ride. I discovered this one time after overhauling the hub 4 times and replacing every single component inside! Some bikes may not be stiff enough to handle Gates. I have yet to see the "Snubber" (roller which installs under the belt at the hub and prevents the belt from ratcheting) in the field. Every time I visit a bike shop I check the belt tension on bikes on the sales floor. Not once has one been even close to tight enough!!!! Reason, the sales person said, is that the belt has too much drag if tensioned properly. The hub is adjusted the same as any cup and cone hub. However, to do an accurate job, the right side of the axle needs to be clamped in a vise. Then just take out the play and lock down the lock-nut. Double check your adjustment at the rim for play. You want to just eliminate the play. While a little play is OK, too much will damage the races or cause other internal problems. A tiny amount of play is OK. However that recommendation is for old hubs. Modern high quality hubs like Shimano should be adjusted with no play.